Short explanation on the use of used to and would, followed by an exercise. 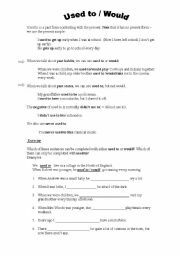 It´s a worksheet on the Second Conditional with gap-filling and matching exercises along with a short explanation on the grammar item. 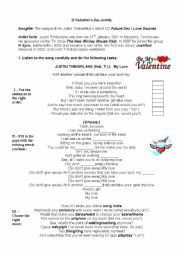 Song by Justin Timberlake "My LOve"
Gap-filling exercise, multiple choice and looking for opposites using the lyrics "My love" by Justin Timberlake feat. 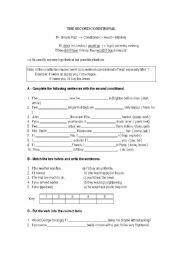 T.I Revising the Second Conditional. 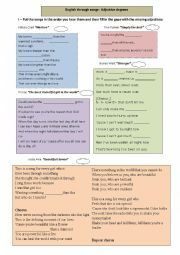 Students listen to some songs and fill in gaps using the comparative or superlative of adjectives. 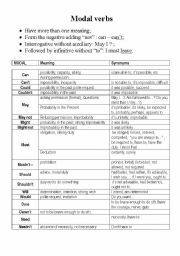 There are some follow-up activities related to this grammar item. This song is a starting point to talk about The Troubles in Northern Ireland. 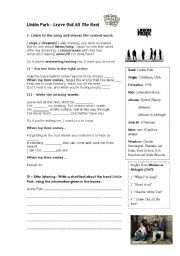 Students have to do several tasks while listening to the song. A nice song by Linkin Park with different activities. This is a great film about the conflict in Northern Ireland. Students watch the film and do some exercises. 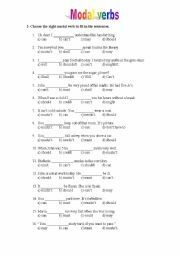 A multiple choice exercise on Modal verbs. 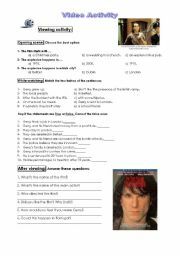 It´s a listening test. If you leave your e-mail, I´l send you the audio files.